Western Massachusetts claims one of the most significant collections in the nation. 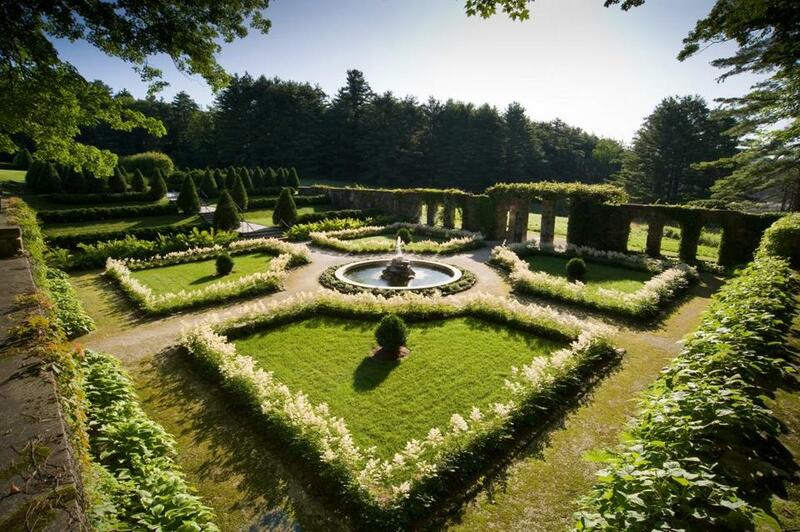 OLD GARDENS that survive their owners are quite rare in this country, but the Berkshires — a wealthy summer colony for so long that it’s been called “the inland Newport” — has one of the nation’s most significant collections, mostly clustered around Stockbridge. If you’re heading west, I think you can do no better than The Mount and Naumkeag, products of creative geniuses with very different visions. Between 1901 and 1911, Edith Wharton modeled THE MOUNT (413-551-5100, edithwharton.org) on the classical European gardens and architecture she wrote about in her influential design books, while landscape architect Fletcher Steele molded NAUMKEAG (413-298-3239, thetrustees.org/naumkeag) into one of America’s first modernist landscapes between 1926 and 1955. Happily, both are in great shape and facing positive futures thanks to careful stewardship. Of course, Wharton also wrote novels, penning Ethan Frome and The House of Mirth in her bedroom overlooking the garden in Lenox. Her friend and fellow novelist Henry James called The Mount “a delicate French chateau reflected in a Massachusetts pond.” If you like tons of pretty flowers, as I do, the French Garden at the sunny end of the Lime Walk is a knockout, with thousands of period and modern blooms throughout the season, which begins May 3. The walled, shady Italian Garden at the other end of the Lime Walk is a more staid design statement, with hundreds of white flowered begonias, astilbes, and hostas planted in patterns. 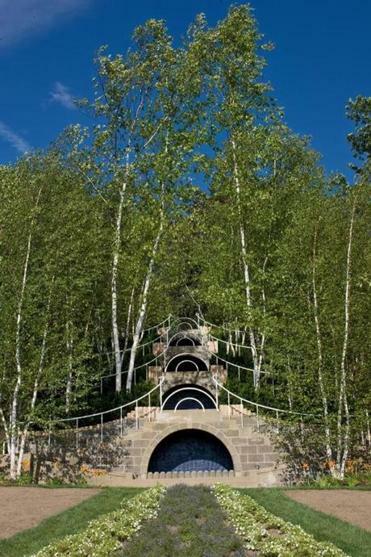 The Blue Steps at Naumkeag in Stockbridge feature fountains and white paper birch trees. Like The Mount, Naumkeag in Stockbridge is composed of numerous smaller gardens, but its international fame rests on a single image, the Art Deco Blue Steps, which are rivaled only by Isabella Stewart Gardner’s nasturtium-draped courtyard as an icon of American garden design. A grove of white paper birch trees on a steep hillside frames a series of four demi-lune blue fountains with horizontal sweeping white railings. A million-dollar gift from an anonymous donor helped sponsor the replanting, repainting, and repair of the Blue Steps and several other garden features last year. Fund-raising and other restorations continue, so more iconic garden rooms will be wearing a fresh face when Naumkeag opens for the season May 26. 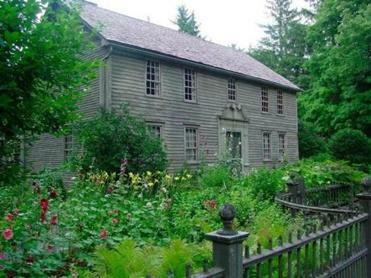 But Naumkeag’s garden did not need to be re-created like The Mount’s, because it was never lost. Unlike most of Fletcher Steele’s over 500 other mid-century gardens that have vanished like snowflakes, Naumkeag has always been well cared for, thanks to its previous owner, Mabel Choate. For 30 years, she engaged the pioneering modernist to develop an 8-acre sequence of landscaped garden rooms, and upon her death in 1958 she endowed and bequeathed the resulting masterpiece to the Trustees of Reservations, which also received 30 years of Steele’s documentation for it. Pretty plantings can be found at Stockbridge’s Mission House, worth a stop if you’re visiting Naumkeag nearby. MY NUMBER THREE must-see garden, after Naumkeag and The Mount, is the august BERKSHIRE BOTANICAL GARDEN (413-298-3926, berkshirebotanical.org) in Stockbridge. It opens for the season on May 1 and is very user-friendly, thanks to education programs run by Elisabeth Cary. But in addition to her chicken coops and vegetable plots for children, the garden has truly inspiring mixed borders. There’s even a Martha Stewart Garden, complete with a little building and wattle fencing woven from willows. It’s impossible for true gardeners to leave without some ideas they want to try at home. The Trustees of Reservations are the owners and preservers of several other Berkshire period gardens, including another designed by Fletcher Steele. The MISSION HOUSE (413-298-3239, thetrustees.org/missionhouse) in Stockbridge was built near the present location of Naumkeag around 1742 for a minister sent to convert the local Mohican Native Americans. It was moved to its current spot by Mabel Choate, who also restored it and contributed period furniture. She then hired Steele to create his idea of an 18th-century New England farmscape on the surrounding half acre in 1927 before donating it to the Trustees. Steele added a barn-like building, cobbler-shop replica, grape arbor, and pretty front-yard garden. It’s easy to drop by after viewing Naumkeag around the corner, and you are free to walk the grounds any time, though you need a ticket to tour the house interior. The Trustees’ newest Berkshire property is the 120-acre ASHINTULLY GARDENS (413-298-3239, thetrustees.org/ashintully) at the southern end of the Tyringham Valley. At the foot of the hill is a modern garden built around a steep rushing mountain stream by contemporary composer John McLennan as a creative parallel to his musical work. But the best thing is the hike up the wooded trail to the ruin of McLennan’s 35-room childhood summer home — once the largest mansion in the Berkshires. Called the Marble Palace by locals, it caught fire one day in 1952. All that’s left is a stone foundation the size of a municipal courthouse and four 30-foot-tall white columns framing an unspoiled view. It’s now the ultimate garden folly. If I were going to pop a marriage proposal, I’d do it here. For a gentler grade, take the overgrown roadbed back down. It is lined with mossy cobblestone retaining walls that add to the romantic sense of a lost world. The property opens for the season on June 4; it’s free to visit the gardens and trails. If you find yourself in the Berkshires in early spring, visit the wildflowers of BARTHOLOMEW’S COBBLE (413-229-8600, thetrustees.org/bartscobble), a rare geological outcropping of marble and quartzite in Sheffield. Most wildflowers will be in bloom mid-April through May. A Trustees property, the Cobble also has a natural history museum that’s open year-round and natural history tours that you reserve in advance. A great Trustees property to stay at during a Berkshires ramble is the GUEST HOUSE AT FIELD FARM (413-458-3135, thetrustees.org/field-farm) in Williamstown. A favorite with fans of the International style and reopening on April 4, it is furnished with very fine studio furniture, as well as American art and sculpture from the postwar period, when it was home to collectors Lawrence and Eleanor Bloedel. Each guest room is like a little museum gallery with write-ups on the furnishings. (Ours included a chair with seating woven from recycled World War II parachutes.) The surrounding garden (and 4 miles of hiking trails) is open free to the public. Do check out the Folly, a remarkable guest cottage designed by Ulrich Franzen in 1965. As modern sculpture has gotten more insistently monumental, the rolling lawns and woodland walks of many Berkshire estate gardens have become outdoor galleries. We saw great examples displayed at The Mount and at CHESTERWOOD (413-298-3579, chesterwood.org), summer home of Daniel Chester French, who sculpted the Concord Minute Man and put Lincoln in the Lincoln Memorial. Now that’s monumental sculpture. Chesterwood in Stockbridge contains French’s house, studio, and a turn-of-the-last-century garden designed by French himself, with perennial borders, a fountain, marble exedra, and a long vista walk leading to woodland paths. Owned by the National Trust for Historic Preservation, it opens for the season May 24. If you need a palate cleanser after such rich fare, visit the HANCOCK SHAKER VILLAGE (413-443-0188, hancockshakervillage.org) on the outskirts of Pittsfield. A utopian religious community from 1791 to 1960, it is now operated as an outdoor living history museum and opens April 12 to showcase the animals recently born on the farm. The Shakers were dedicated to utility and simplicity, everything the Gilded Age wasn’t. Though they are most remembered for their furniture, they were primarily farmers. Their many innovations include putting seeds in paper packets for sale. They also sold medicinal herbs for every ill, and their production fields are lovingly reproduced here. This beautiful farmscape has a calming and uplifting effect on all who find the time to stay awhile. Carol Stocker writes regularly about gardens. Send comments to magazine@globe.com.